Julie Staffen, Award winning author and contributor to the Chicken Soup for the Soul Series, grew-up in a small town in Michigan with her parents and one brother. 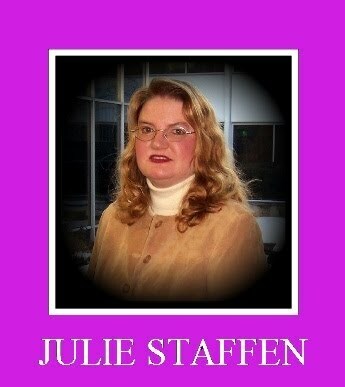 During her life Julie has had experience in retail, banking, human resources and college administration. Through her work in human resources and college admissions, Julie spent a great deal of time helping adults figure out what they wanted to be when they grew-up. Using this experience and her education, BA in English and MBA, Julie created a character named Krista Kay. Her first book in the Krista Kay series, Krista Kay Summer Adventures and the Mom's Choice Award winner- Krista Kay Mackinac Island Adventures, will help children learn about people in different careers through the 10 year old Krista Kay. Each of the books in the series will follow Krista Kay through her adventures and introduce the readers to people in different careers ranging from unskilled, skilled and professional levels. Read Julie's story in Chicken Soup for the Soul- Living with Alzheimer's & Other Dementia. Julie still resides in Michigan with husband Tim and her son Landon. She is currently writing more Krista Kay books as well as a Women's Fiction book and has several ideas for many more stories. Julie is a member of the Society of Children's Book Writers and Illustrators.